The compass has been used by political scientists to label certain political positions and ideologies by dividing policies into two categories: economic and social. The top and far left of the compass represent maximum government involvement, while the bottom and far right represent the least amount of government involvement. A far better way to label political ideologies has been in more common use over the past few years. The simple scale puts maximum government involvement at one end and zero government at the opposite end. This scale has helped eliminate the erroneous labels applied to the right, which has included religious fanaticism and social conservatism. The simple scale narrows down the right and left labels. Maximum government includes communism, fascism, totalitarianism, and all forms of social and economic restrictions. Minimal government includes social liberalism and libertarianism. This scale simplifies the troublesome confusion caused by the traditional compass. Being a centrist would be what Canadians call a liberal. A liberal in the United States is often put in the same category as a socialist. Both countries can agree that the term centrist implies that one is a political moderate. Regardless of being labelled a centrist, all centrists will make decisions and hold positions that fall on either the right or left of the scale at any given time. Most modern democracies fall in the center of the simple political scale. Countries like China and Iran both fall near the far left of the simple scale. Although most political parties in North America are labelled right or left, the simple scale keeps all of them in the center. Traditional U.S. conservatives often hold socially restrictive policies that put them further to the left on the simple scale, while their liberal economic policies move them further to the right. This simple scale reverses the commonly held belief that social conservatism is a right-wing ideology or that social libertarianism is a left-wing ideology. According to the simple scale, any and all forms of government intervention and control are considered left-wing. 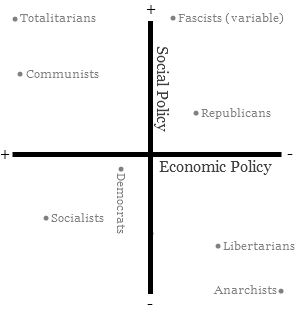 According to the simple scale, although socialists have restrictive economic policies, their liberal social policies keep them slightly closer to the center than communists and fascists. Conservatives in the U.S. hold that the constitution and the social values of the founding fathers should be upheld. Canadian conservatives hold similar, economically liberal values, but hold a loyalty to the parliamentary traditions of the United Kingdom and its constitutional monarchy. Socialism is an offshoot of communism that uses democracy to achieve much of the same economic goals, but does not uphold the same socially restrictive traditions as communism. Socialists believe in a contrived and lawfully mandated form of social equality, while conservatives and libertarians believe that equality can only be fairly achieved naturally (if at all) and that a government's only obligation is to treat all people as equals under the law. This means not applying discriminatory labels to individuals, such as "visible minority". Both conservatives and socialists aim to achieve social and economic prosperity, but using different policies. Conservatives believe that social prosperity is best achieved with liberal, laissez-faire economic policies. Socialists believe in achieving social justice and equality by directing and controlling the economy and redistributing wealth. Right and Left are inevitable labels, whether we like it or not. Political scholars, pundits, and scientists will use these labels to define any decisions made by leaders and political parties. Those who refuse the labels are often centrists, but their policies and beliefs will still be distinguished with one of the two labels. Understanding the fundamental differences between these two inevitable labels is essential to understanding politics in North America. Failing to do so only implies political illiteracy.